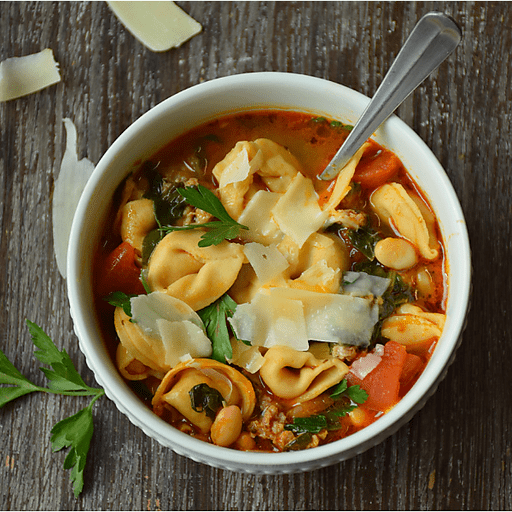 The soup du jour is Italian Sausage & Tortellini Soup: a rustic compilation of robust, yet sweet turkey sausage, fresh, colorful spinach, soft tortellini pillows and juicy tomatoes, all brought together in a flavorful Italian seasoned broth. 1. Heat olive oil in a large pot or Dutch oven to medium-high heat. Add onion and saute 3-4 minutes, until soft. Add garlic and saute 1 minute, until fragrant. Add ground turkey sausage and allow to brown, about 5-6 minutes. Stir in chopped spinach and saute until it wilts, about 1 minute. Stir in seasonings and a pinch of salt and ground black pepper. 1. Add great northern beans, seasoned diced tomatoes with the juice, chicken broth and tortellini and bring to a boil. Reduce to medium, cover and allow to cook 10-15 minutes, until tortellini is fully cooked. 1. Taste and season as necessary. Top with parmesan cheese and parsley. Per Serving: Calories 300, Total Fat 12g (Saturated 2g, Trans 0g), Cholesterol 60mg, Sodium 660mg, Total Carbohydrate 28g (Dietary Fiber 4g, Sugars 4g), Protein 21g, Vitamin A 20%, Vitamin C 25%, Calcium 10%, Iron 15% *Nutritional values are an approximation. Actual nutritional values may vary due to preparation techniques, variations related to suppliers, regional and seasonal differences, or rounding.